[prMac.com] Hagenberg, Austria - Ergonis Software today announced the release of Typinator 5.8, a new version of their popular text expander. The new version lets you define a hotkey to instantly search for matching snippets while you are typing. Finding good, short and still unique abbreviations can be a challenge, in particular, when you have hundreds of similar items. Typinator's new suggestion feature helps you find snippets as you type them. Just type a part of the abbreviation or a word that occurs in the expansion, followed by the custom keyboard shortcut for the new "Suggest Abbreviation" feature. Typinator immediately comes to help by displaying a list of all matching items and allowing you to choose the item you need. Besides this major new feature, Typinator 5.8 comes with many other improvements. It now offers new AppleEvents to enable third-party utilities to define new snippets, and offers improvements in the Registration window to avoid misunderstandings with correctly registered licenses. On Mavericks, Typinator shows a clearer message at the bottom of the window when it does not have "Accessibility" permissions, works around a cursor positioning problem, and improves positioning of the QuickSearch input field and result list. Typinator 5.8 also improves compatibility with many third-party applications like Lotus Notes, MS Word, LiveCode, PowerMail, Firestorm, Linguist, TextSoap, and others. Typinator 5.8 requires Mac OS X 10.5.8 or newer and is compatible with OS X Mavericks. Typinator 5.8 is a recommended upgrade for all users running on OS X Mavericks. Typinator can be purchased securely on the Ergonis Software website. 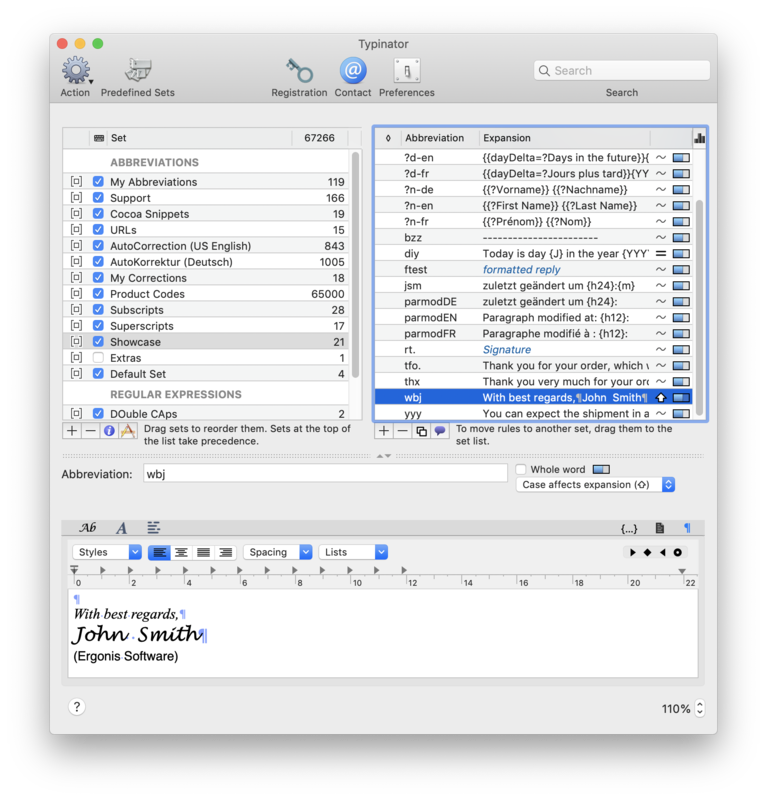 The upgrade to Typinator 5.8 is free for anyone who owns a valid license for Typinator 5. Upgrade paths are available for owners of older licenses. See the company's web site for information about purchases, including enterprise licenses, volume discounts, and upgrade pricing offers. Instead of purchasing Typinator by itself, customers can get the Ergonis Productivity Bundle that also contains two of the company's other productivity tools, PopChar X and KeyCue. Headquartered in Hagenberg, Austria, Ergonis Software Gmbh is a privately held software development company founded in 2002. With a focus on innovation, Ergonis develops ergonomic and intuitive software that boosts the productivity of Mac and PC users alike. Copyright 2002-2014 Ergonis Software Gmbh. All Rights Reserved. Ergonis products are either registered trademarks or trademarks of Ergonis Software GmbH. Other company and product names may be trademarks of their respective owners.